We value the funding Impetus provides. However, their unique approach in providing management advice and pro bono consultants gives a huge amount of added value. The need: Good GCSE grades are gateway qualifications for further study and fulfilling work. But only 33 per cent of young people on free school meals achieve five good GCSEs, compared with 61 per cent of all other pupils. 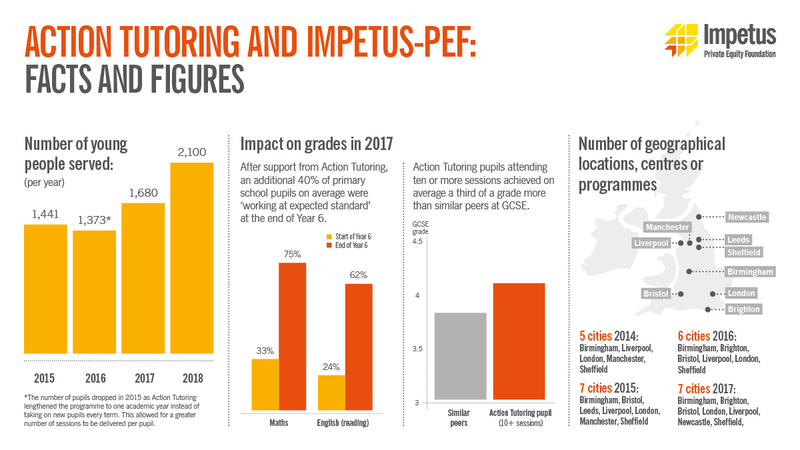 Our charity partner: Action Tutoring works in seven cities providing trained volunteer tutors to support pupils from disadvantaged backgrounds to pass their GCSEs. Our impact: We have helped Action Tutoring to make their tutoring programme even better during our three-year relationship. They have a stronger curriculum, a longer programme and new performance management processes. Pass rates from the pilot of their new maths programme rose to 70 per cent in 2016, up from 49 per cent in 2014.